I am not a sucker for frying tomatoes for my stew till they are dry…I fry sometimes though for a difference. If there is any cooking style that is faster and yet gives good result, why not go for it. This quick no-fry beef tomato stew is my fast method of making stew without being kept on my toes stirring tomatoes to avoid it getting burnt. You can try it for the family and add it to your stew cooking styles book. If you have a particularly tough meat, you can pre-cook the seasoned meat for a while before combining with your tomatoes. Pre-season beef in a pot for at least 30 mins with some onions, seasoning cube, crushed garlic and ginger. Blend tomatoes with onions and peppers and pour into the pot of beef. Add the the tomato purée and the remaining seasoning into the pot. Add the cooking oil and combine together before putting on the gas or stove to cook. I learnt recently that placing a wooden spoon over the pot stops the stew from splashing all over the place. I tried it…yes, it worked. Allow to cook till the meat is tender and the oil starts to float on the top of the pot. Add some water if it gets too thick and adjust for taste by adding some salt or more seasoning if need be. 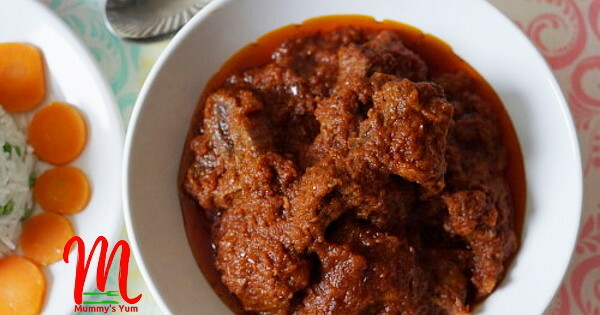 Serve with choice of rice, potatoes, plantain or beans. Remember to like Mummy’s Yum on Facebook and follow us on Twitter and Instagram. Have you tried any of my food ideas? Post a picture and tag us. Subscribe to Mummy’s Yum Newsletter and receive notification of new recipes, tips and meal planner ideas to come. I will defonitely be trying this. So, i do not need to cover the pot at all? Sure do Cindy. No need. just follow the recipe. Hmnnnn…looks yummy..I sure will give this a trial. Yipeee. Thanks for the feedback. I certainly will try this and I know my family will love it. Thank you Agatha. Please give your feedback once you try it. yes, its a myth yet it works – not just for stews but for anything and everything that boils over. Nice recipe. Thanks for sharing. Thank you and hope you’ll try it. Nne, you have just made my weekend.🙌🏾. I already knew about the wooden spoon , i use it when frying chin chin . LOL. Chisom, that splashing tears me up.